Sunflare is just one of those examples of how to use the available light to create stunning effects in photographs. I would usually try to avoid taking pictures in the middle of the day, and particularly under the dappled light of trees, but seeking out the sun to use it directly in your images can be fun and inventive. Will is such a visual kid. He is the child who sees a machine on tv, in a book, or out and about, and immediately wants to make it himself. He has the biggest collection of Lego I have ever seen, and you would be amazed what he can create with nothing more than a cardboard box and a reel of tape. I hope he never loses his creativity and inventiveness. I took this picture in front of our house, at 1:45 in the afternoon. 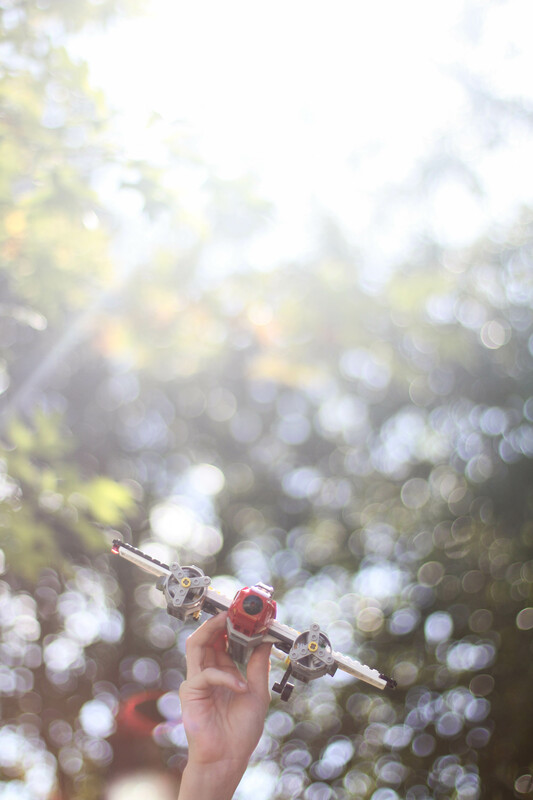 I knelt down and pointed the camera upward while Will held up his airplane, as much in the shade as possible, with the sun streaming through the trees behind him. I focused on the nose of the plane, with the sun in the top left corner of the frame. My ISO was set at 100 because it was so bright and sunny outside, and my shutter speed was very high at 1/2500. I set the aperture to f/1.4 to blur out the background, and it helped produce an amazing bokeh. Post-processing in Lightroom enhanced the image. I slightly increased the exposure and the temperature, and then more so the contrast. I reduced the highlights, shadows, and black clipping, then increased the vibrance and saturation. Finally, to enhance the nose of the plane, I increased the red saturation. The forecast for today was SUN and it was perfect timing for the challenge of the day, ‘sunflare’. But instead, we were welcomed this morning with more overcast skies and snow showers. I shouldn’t be surprised. It’s Buffalo, sitting on Lake Erie, and the weather often changes by the minute. My son is studying bird and tree identification in his 5th grade science class, and my husband and I have found ourselves engrossed in the subject. We decided to not let the frigid temperatures deter us from our original plan, and we headed to Hoyt Lake in Delaware Park to bird watch and hopefully play with my iphone camera and the sun’s rays. We were delighted to have some Mourning Doves, Chickadees, a Robin and a Mr. and Mrs. Cardinal join us, but the sun was most definitely absent. I opted to go ahead and shoot my photo for the challenge and add ‘sunflare’ during the edit. Yes, nowadays there is an app for everything! 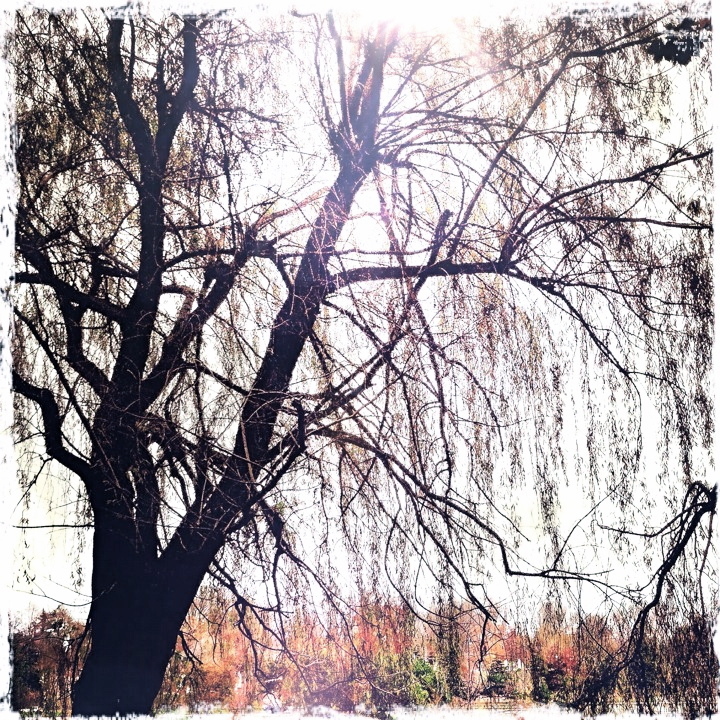 I took this photo from the woods, and captured the natural morning light peering through the leaves of the willow tree. I cropped, auto adjusted color and contrast, and sharpened in Snapseed. The photo was still dark and cold, so I applied the Sunshine effect in Camera 360 and followed with the Rise effect in Instagram. I now had my ‘sun’, but still needed the ‘flare’. So, I went into LensFlare and added the effect, Ion Spike and then the texture, Big Spots. I then framed in pxlromatic. As I type, I think I might see a snid bit of sun from outside my window? Hoping tomorrow I can show you Buffalo, NY in a ‘different light’. Breath taking photos ladies…. I loved these ones!!! I’m really loving reading your descriptions and feeling your passion…. Bravo!! Both these pics are really nice….and really different. Great job!